Durable, flexible vinyl bumper sticker with removable adhesive. Union-printed in the USA. Car safe. Outdoor durable for 3-5 years. Paid for VoteVets Political Action Committee. Not authorized by any candidate or candidate's committee. VoteVets Action Fund is a 501(c)(4) organization which primarily focuses on nonpartisan education and advocacy on behalf veterans and their families. 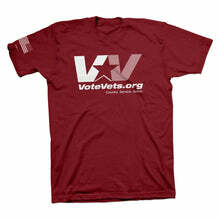 VoteVets Political Action Committee is a federal political committee which primarily helps elect Iraq and Afghanistan war veteran candidates and educates about veterans and military issues aimed at influencing the outcome of the next election. 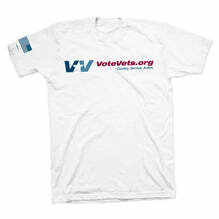 VoteVets Political Action and Vote Vets Action Fund are separate organizations.